I’ve been having mucho fun playing with the beta version of the newww Genus Project Mocap head. This beta is available for a very limited time (until Monday) and a reduced price. You can pick yours up for 3000L, the full version will cost 5500L. If you do purchase the beta, you will be updated to the full version upon release. 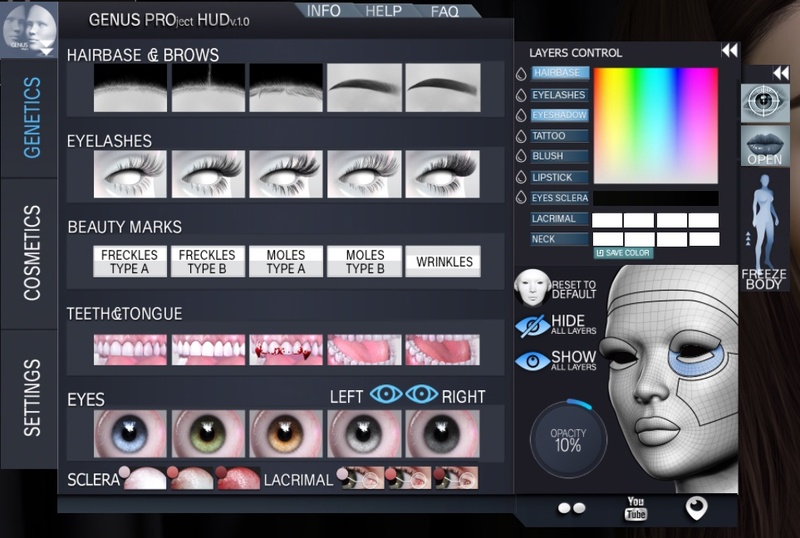 In the pack, you will find the head, eyes, jaws, neck fix, settings hud, 3 skin applier tones, a shape and some gestures. 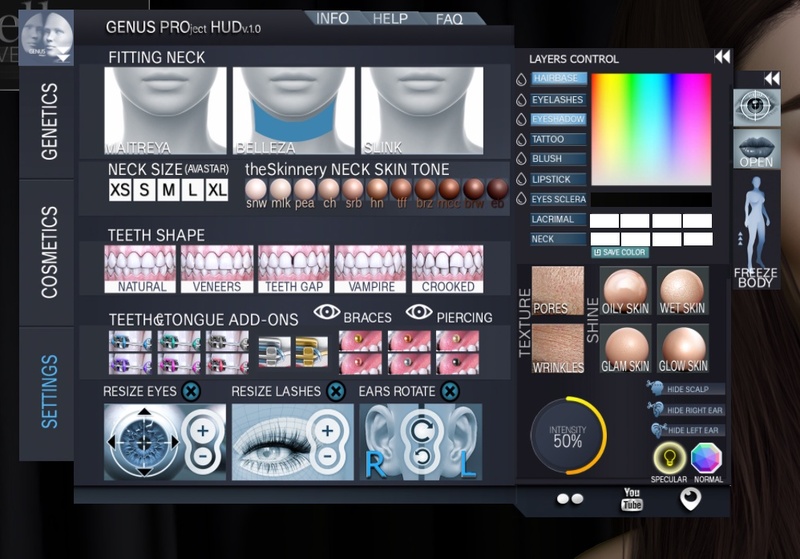 The skins match The Skinnery tones and you can find body appliers at their main store. Lets talk about the hud. If you were a Genesis lab user previously, you will find this new hud to be an awesome upgrade. Shown below are the 3 main pages you can find on the hud, genetics, cosmetics and settings. Along side of each main page is the mini layers control section. 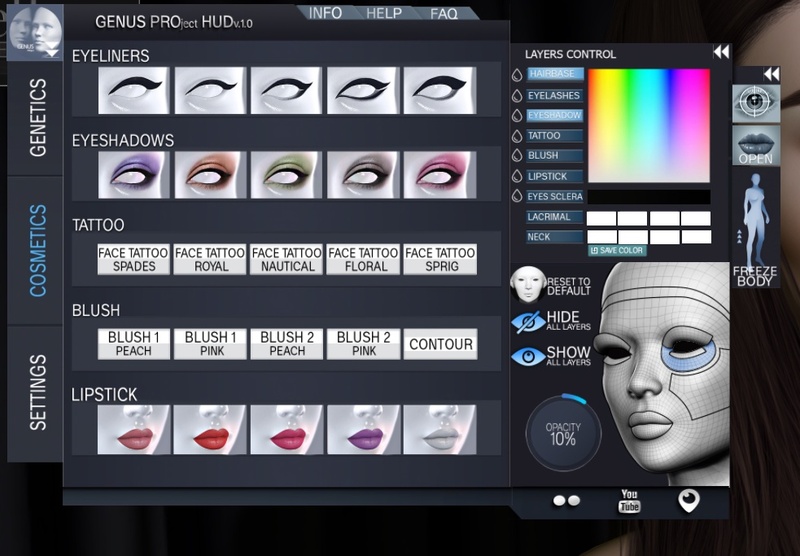 The cosmetics page is also incredibly customisable. With the tint and opacity options you have so much to play with! I know that the full release will make all layers including skin omega compatible. This is a huge step forward imho, as I would love to see some of the skins in my inventory on a genus head. The settings page is where you will find the ability to change the look of the skin itself, and is the page that has got everyone so excited with it’s incredible wet option. My fave part is the pores, I spent a good hour just clicking that on and off and ooohing over it LOL. The shape of the head itself is not classical Genesis Project, the profile is a good deal different to what you may be used to. The nose is not my favourite part, but I can work with it for the time being as I’m sure there will be future head releases. My faves previously were Molly and Flor, both of which had beautiful noses that you could really customise via your shape. All in all, the changes that have been made are fantastic ones, and I’m sooo excited for the full release when I can play around with animations.